Has your doctor tested you for Vitamin D deficiency? I’m going to explain why Vitamin D deficiency is connected to Hashimoto’s hypothyroidism. Vitamin D is a critical regulator of your immune system and research has already established that Vitamin D deficiency is highly associated with other autoimmune diseases like Multiple Sclerosis and Type I Diabetes. And Vitamin D deficiency IS associated with Hashimoto’s hypothyroidism–another autoimmune condition. Hashimoto’s is an autoimmune attack on the inside of your thyroid gland. Over time, your immune system destroys the inside of your thyroid gland—so much, that you can’t make enough thyroid hormones and you suffer low thyroid symptoms. What low thyroid symptoms does Hashimoto’s hypothyroidism cause? In 2011 a great scientific study looked specifically at Hashimoto’s patients and Vitamin D.
The researchers took 161 confirmed Hashimoto’s patients (meaning these people had positive TPO antibodies and/or positive TGB antibodies) and measured their Vitamin D levels. The results of their study are downright scary. 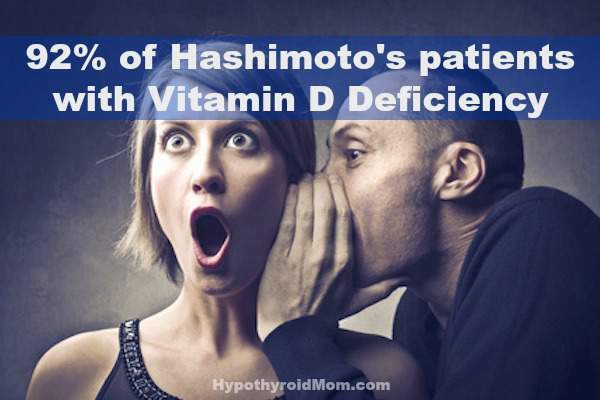 92% of the Hashimoto’s patients had Vitamin D deficiency. This study defined Vitamin D deficiency as less then 30 ng/dl. 148 out of 161 had Vitamin D deficiency. Crazy, right? Let me explain what those mean. The person has high TPO and/or TGB antibodies. The person has low thyroid symptoms (I see these every day). The person does NOT have low thyroid symptoms (I don’t see many of these). Their thyroid lab test numbers are “normal.” (I see quite a few of these people in my practice). Now here’s how they broke it down. 94% of Overt Hypothyroid Hashimoto’s patients had Vitamin D deficiency. 98% of Subclinical Hypothyroid Hashimoto’s patients had Vitamin D deficiency. 86% of Euthyroid Hashimoto’s patients had Vitamin D deficiency. Look at those numbers again….see how many of those Hashimoto’s patients had Vitamin D deficiency? Huge. We know for sure that Vitamin D has something to do with Hashimoto’s. But what exactly does Vitamin D do? Vitamin D is a critical regulator of your immune system. Without Vitamin D your immune system can become over-exuberant. Without Vitamin D your immune system can easily become unbalanced. Vitamin D deficieny can lead to an expression of an autoimmune attack on a tissue. So for example in Hashimoto’s…. if you carry the gene for Hashimoto’s and you become Vitamin D deficient your gene can turn on and you can start expressing it and start attacking your thyroid. Over time you become low thyroid and you develop low thyroid symptoms. …but in the long run you end up not feeling much different because the replacement hormones just don’t do much for the underlying autoimmune process. Sadly, this is exactly what usually happens to a person with Hashimoto’s. Does this mean that you should buy Vitamin D and start supplementing? Because even though Vitamin D is relatively harmless, you don’t know how much you need. Plus, there’s a complex situation in which if you take the wrong dosage of Vitamin D— read carefully— if you take the wrong dosage of Vitamin D you can actually make yourself worse. Taking the wrong dose of Vitamin D can make you have MORE low thyroid symptoms—even if you really are Vitamin D Deficient. That scenario nvolves something called 1, 25-dihydroxy vitamin D, and is a little bit beyond what I want to explain here. Even though there’s a 90% chance that you’re Vitamin D deficient if you have Hashimoto’s— this doesn’t mean you should go out and start supplementing Vitamin D.
You need to find someone who understands exactly what I’ve been telling you about, someone that understands there are other things to look at… and that Vitamin D, even though it’s important, is not the magic bullet. In my practice we see a lot of people that need Vitamin D but some people need more or less than others–and many times it’s the difference between the person feeling good or feeling worse. A small number people can’t take Vitamin D at all—even though they’re defiicient. Find someone that knows what to do. Dr. David Clark found Chiropractic during his journey to change his own health and poor habits. In 2005 Dr. Clark became one of less than 1,000 board-certified Chiropractic Neurologists in the world. Chiropractic Neurology brings together current research findings from fields such as psychology, neuropsychiatry, neurology, neurophysiology and nutrition. Dr. Clark has lectured at leading chiropractic colleges, medical schools and private schools on topics such as alternative medicine, nutrition, neurology and learning/behavior problems such ADHD, Autism and Dyslexia. He specializes in treating Hashimoto’s Autoimmune Thyroiditis at his Center for Low Thyroid Solutions in Durham, NC. Thyroid. 2011 Aug;21(8):891-6. Epub 2011 Jul 13.
she also done the vitamin D treatment for a month. Honestly, guys, just take a vitamin D supplement with K2. Test your levels frequently and stop when you end up around 80. I have recently gone through ct scans and ultrasounds on a 3.4×2.5 nodule on my left thyroid, was diagnosed with hypothroidism in 1995 , have been taking synthroid and now levothyroxin, highest dose for over year now. 137. Have had many problems. Have also had in 2 years fractures in both feet. My orthopedic Dr. Called yesterday after blood test for vitamin d deficiency, says I am at 15??? Wants to put me on a prescription strength vitamin D, after reading this article I think I need to call him back, I don’t believe he read all my history and what’s going on right now, which I can’t even get into the referral endocrine Dr until end of Oct for biospy. Frustrated and tired!!! Is there a doctor in Chicago area that treats thyroid conditions? Hi Bobbie, I put together this list of resources to help my Hypothyroid Mom readers locate good doctors by area. How is this helpful? Vitamin D deficiency can be causing you to be terribly ill, but whatever you do, don’t take it. What a stupid, frustrating article! I was lucky enough to have found a Dr that did all the proper tests. I was diagnosed with hashimoto’s today along with vitamin D and vitamin B deficiencies. I am so relieved to have a diagnosis that explains my symptoms. I went to several Drs before I found her, I asked them all if upon testing for hashimoto’s we stumbled on a diagnosis of they would treat my symptoms or the disease. She was the only one that said she would treat the disease. I hope her treatment plan is a success because I’m sick and tired…literally. Amazing Kelly. What is the name and location of your doctor in case there are Hypothyroid Mom readers here searching for a good doctor in your same location? Kelly, So having found this what has been the start/discussion of your treatment? This blog is becoming pointless. If I could find a dr that knew this I wouldn’t be googling ‘vitamin d deficiency and Hashimoto s’. I guess this whole article was an advertisement for the Dr at the end. How disappointing! Since every doctor I’ve ever been to acts like thyroid issues are no big deal (and I’ve seen MANY doctors) I won’t hold my breath on finding a good one who will help. I agree with you totally! I can’t stand it when they say “find someone professional that can help you”…. and where would that be? ?